I have not revealed this wonderful news to my readers yet - not on Naked Glory anyway - because I wanted to give you a surprise - I WILL BE GOING TO PARIS!!!!!!!!!!!!! I'm sorry. I normally don't put caps and a gazillion exclamation marks in my writing when I blog but I just cannot contain my excitement this time. I've been wanting to go to Paris since I started learning french when I was 13 years old. It's my dream city where everything I love is concentrated; it is the accumulation of the creme de la creme of everything fine in life, be it art, history, architecture, fashion, cuisine, opera, theatre, literature...I can go on and on. Before I head to Paris, I thought it would be best to do some background check on the city dwellers - specifically the Parisienne girls that all seem to be inherently chic and stylish. 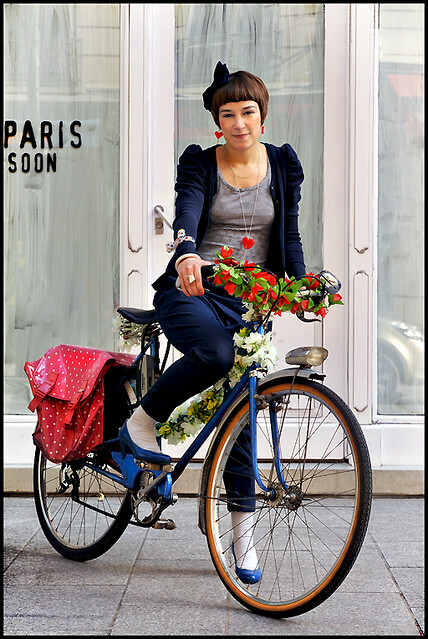 The photos are from Vogue.fr and Paris streetstyle photographer Fred of Easy Fashion in Paris. Check out his blog - his photos are all very natural and a joy to look at. Love the colours & her feather hair extensions! The girls in Paris all look so chic no matter what their age is because they don't follow trends - so in a way they are not fashionable, but they know how to dress well by mixing up a few classic pieces and developing their personal style. Here are some observations that I've gathered to help you (and me!) nail that Parisienne chic look. 1. If you notice in the above photos - they all (almost) have 1 thing in common - and that is a fitted blazer, or at least a smart looking outerwear. Be it a long or cropped blazer, black, navy or even salmon one, the blazer hold their look together to make them look chic. 2. Paris women wear jeans but do not make their look sloppy. They do this by picking solid coloured jeans instead of the usual ones you find that has a various types of washes that turn out weird-looking. The jeans should fit them well and enhance their silhouette - some people pick skinnies, some straight-leg and bell-bottoms, but ultimately the cut of their denim still ties in with the overall look. 3. They know the value of good accessories - and accessorize their look with good shoes and bags. Most of the women carry small boxy handbags or slightly bigger motorcycle or duffel bags with a good shape and quality. No surprise here, considering many of the luxurious leather goods designers first originated from Paris, such as household names Louis Vuitton and Hermes. Shoes are usually close-toed and ties in with their entire look. So if you're in France and do not want to look like a tourist, or you simply want to emulate the timeless elegance of Parisians, here's a Polyvore set for you! 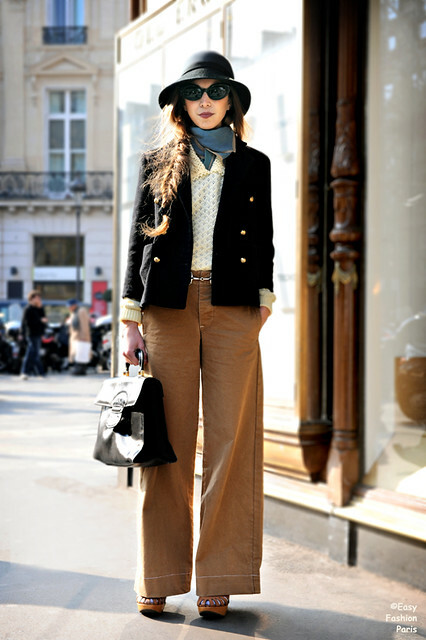 In short, Parisian women take fashion seriously, but they are more conscious about the overall look of their ensemble rather than the labels. They are casual in their approach to dressing up as can be seen by their embracing of jeans and floral print summer dresses, but they know how to dress it up by pairing it with a blazer with a good cut, as well as accessories. Anyway, the above video was a commercial made for EF Language Centre. This is how commercials should be made. It makes me very happy each time I watch it & I've watched it at least 5 times. I can't wait to go to Paris - I will be stalking the male models during Paris Fashion Week (Men's) and also Haute Couture shows from 4-7 July. Fingers crossed that I'll get photos of my favourite models - Karlie Kloss, Frida Gustavsson, Sasha Pivovarova, Sun Feifei and Liu Wen - and also photos of amazing editors Kate Lanphear, Anna Dello Russo, Anna Wintour and Taylor Tomasi. I'm not sure whether they would be at the haute couture shows but it's definitely worth a shot! Wish me luck.